The best of the action from Saints' victory at Wigan. Our 90-second highlights from Saints' cup success at Wigan. New boss hails travelling fans after cup progress at Wigan. Watch Pierre-Emile Højbjerg react to Saints sealing a semi-final place. The pick of the action shots from the DW Stadium. Højbjerg: "Happy to make the fans smile"
Danish midfielder speaks after netting a timely first goal for Saints at Wigan. New boss delighted as players refuse to come unstuck at Wigan. Watch the new manager's first post-match interview. Højbjerg and Cédric on target to send Hughes's men to Wembley. Mark Hughes on the threat posed by hosts Wigan. Everything you need to know for your journey to the DW Stadium. Check out our in-depth preview ahead of the trip to Wigan. Tackle our latest quiz ahead of the Emirates FA Cup quarter final with Wigan. 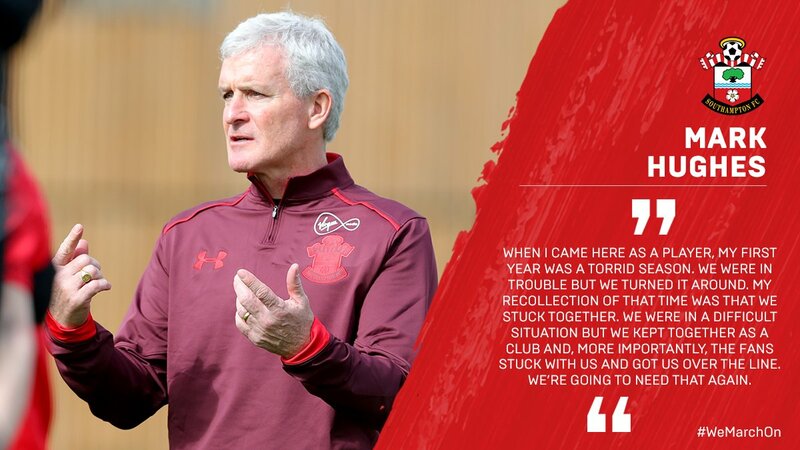 Mark Hughes on Saints' Emirates FA Cup trip to Wigan. Find out what the Latics boss had to say about tomorrow's quarter-final. View the best of the images from Staplewood ahead of Sunday's FA Cup tie at Wigan. Read our scouting report ahead of Sunday's FA Cup meeting at the DW Stadium. Striker out of cup trip to Wigan but nearing a comeback, boss confirms. See the best of the images from the new manager's first day at Staplewood. Watch as the boss takes charge of his first session at Staplewood. We take a look back at Saints' finest moments from the last eight of the FA Cup. Former Saints defender Claus Lundekvam on a special competition. Saints reach FA Cup semi-final! ...And just look what it means! It's a first FA Cup semi-final for Saints since 2003 and a second trip to the national stadium is as many seasons! Head over to @SouthamptonFC on Twitter for all the post-match reaction from the DW Stadium. We're going to Wembley! Højbjerg and Cédric score their first goals for the club and it's a winning Sunday in Wigan!! CEDRICCC!!! It's a brilliant goal to all but send us to Wembley! The Portuguese nods a bouncing ball superbly past his marker and rolls it into the corner! YES! Wigan throwing everything forwards for an equaliser and they almost find one. Noel Hunt heads dangerously towards goal, forcing Hoedt to scoop over the bar under pressure. Come on, Ori! The midfielder is on for the final five minutes plus stoppage time. He replaces Gabbiadini. That's what he's there for! Clever play from Long to hold up the ball, spin his marker and get hisnside up the pitch by winning a free-kick. Shane Long is on for the final 10 minutes here at the DW Stadium. His energy will be key as Saints look to see this result through. Hunt takes the place of Byrne. The Wigan 'keeper makes a superb save low to his left to deny Gabbiadini's well-struck penalty. Superb stop, credit where it's due. ...and the defender is booked for pulling down Gabbi in the box. Gabbiadini fouled by Byrne and it's a spot-kick for Saints to make it 2! ...and Nick Powell takes the place of Massey. YESSS!! Saints lead and it's Pierre-Emile Højbjerg!! Tadić crosses and the Dane pokes in on the run for his first goal for the club! A horror back-pass puts Gabbiadini through one-on-one but the Italian can only shoot straight at the onrushing Walton from the penalty spot. Excellent save but a BIG chance wasted. Saints back off Gavin Massey and the winger drives forward to roll a shot past Alex McCarthy's far post unchallenged. An improvement from Saints here at the start of the second half. The first real spell of possession ends as Cédric is tackled inside the box before Wigan's Jacobs curls one wide of the target. Back underway in Wigan with Saints kicking from right to left as we look. It's a "cross-on-sight" policy for the home side at the moment and it's causing trouble for the Saints defence. A falling Will Grigg is the latest to swing a limb at a bouncing loose ball in the box. Five minutes to half-time in Wigan and there is work to be done for Mark Hughes's men. Wigan are seeing plenty of the ball now as we approach the interval. Tadić whips in a superb cross from the left-wing which Gabbiadini is mighty close to turning home for an opening goal. The flag was up on the near side though against the Italian. Not a lot between the two teams so far. Wigan have perhaps edged things early on; the visitors have faced seven corners in the opening 25 minutes. Massey's cross is half-cleared by Hoedt and straight to the arriving Gary Roberts. The midfielder takes a touch and lifts the ball over the bar from a very good position. Morsy's shot spins dangerously towards goal via a deflection and Dunkley almost converts the bouncing ball at the back post. Wigan on top for now. A few nerves in the Wigan box and Carrillo nearly capitalises. 'Keeper Walton spills a cross from the left but the Argentine can't sort his feet out to finish. Saints look to be lined up in a 4-2-3-1 so far. Forwards Gabbiadini and Carrillo have been alternating the 9 position so far with the Italian dropping deep to collect the ball. The 4,600 Saints fans behind the goal gave Mark Hughes a roaring welcome as he emerged from the tunnel. Even opening here at a blustery and boisteorus DW Stadium. And we're away at the DW! Come on, Saints! i can sense that the lads are ready to go. this run will test us all but this is the business end of the season and we've just got to get it done. Fast approaching kick-off now in the northwest. Saints are out and warming up at a chilly DW Stadium. As you can see, it's a lot greener up there than the south coast today. One change for the Latics meanwhile from Wednesday night's win in League One as Gary Roberts comes in to the team in place of Nick Powell. Will Grigg - the competition's leading scorer with seven goals - leads the line once more. 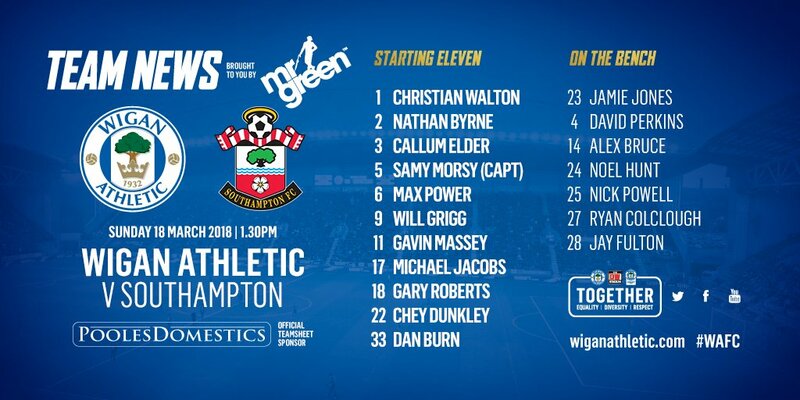 WIGAN XI: Walton, Byrne, Elder, Morsy, Power, Grigg, Massey, Jacobs, Roberts, Dunkley, Burn. Mark Hughes has named his first team selection as Saints First Team Manager, making two changes to the side beaten at Newcastle. 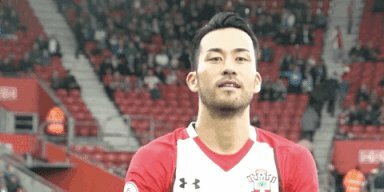 Manolo Gabbiadini and Sofiane Boufal are in, Nathan Redmond and James Ward-Prowse are out. 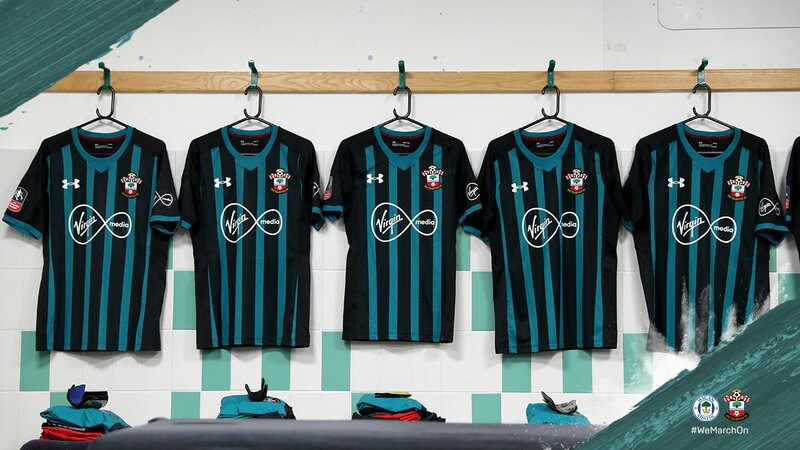 XI: McCarthy; Cédric, Stephens, Hoedt, Bertrand; Boufal, Lemina, Højbjerg, Tadić; Gabbiadini, Carrillo. SUBS: Forster, Yoshida, Long, Romeu, Ward-Prowse, Redmond, Sims. Primed and ready to go in the visitors' dressing room in Wigan. The Saints players will be checking in for FA Cup duty very shortly indeed. This sight will be the reward for those of you who have battled through the snowy conditions this morning. The DW Stadium is ready and waiting. 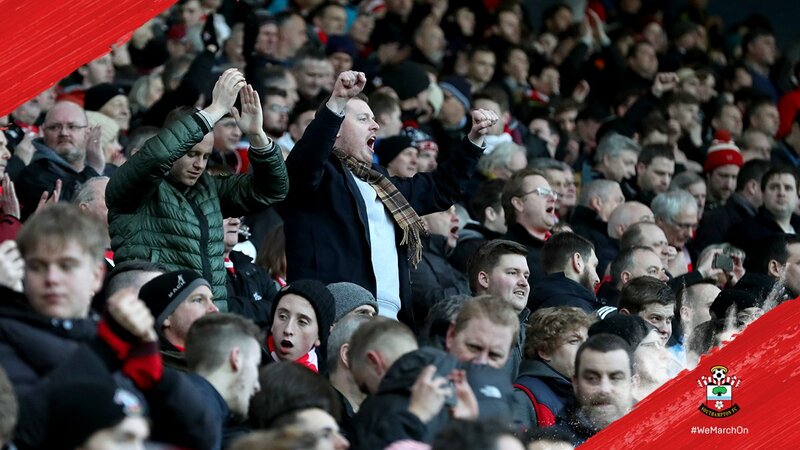 we've got a huge following going to wigan, a following that we'll need now until the end of the season and we've got to give the fans something to grasp and allow them to enjoy their football again. By kick-off, some Saints will have travelled 830 miles in the space of two weekends to follow Mark Hughes's men to Newcastle and Wigan in consecutive weekends. Around 4,600 of you will be with us today at the DW Stadium; brilliant support at the time we need it most. Saints are unbeaten in 18 of the previous 19 ties against lower league opposition but the Latics have already eliminated three Premier League teams on their way to the quarter-finals. A win over Saints would equal a 40-year-old record set by West Ham. Reasons to be excited today: Mark Hughes's first game in charge, a sold out away end at the DW Stadium, 90 minutes from a second trip to Wembley in as many seasons. Rise and shine, Saints, it's FA Cup quarter-final day!